A bakery restaurant from the pair behind Primeur and Westerns Laundry, Jolene is a joint venture between Jeremie Cometto-Lingenheim and David Gingell who have teamed up with farmer Andy Cato. Andy supplies the wheat grains - chemical-free crops grown in a sustainable way - which are at the core of the Newington Green bakery, showcased in dishes like stuffed pasta, sweet tarts and bread, apricot and butter pudding. 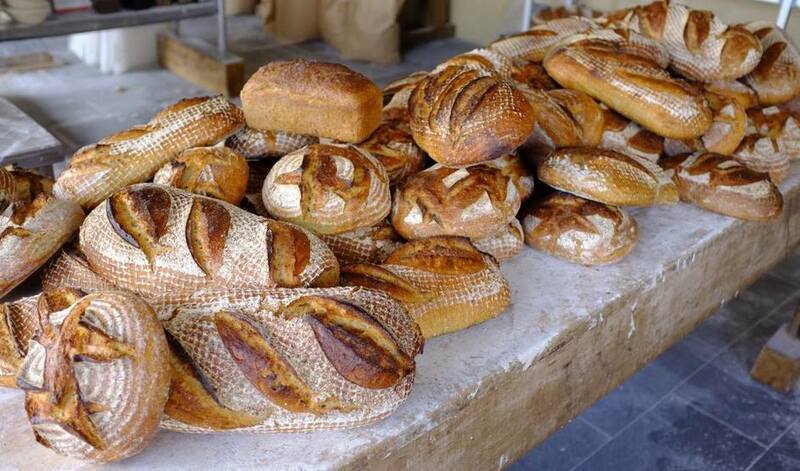 Naroques bread, sausage rolls, madeleines and cinnamon buns are just some of the freshly baked goods to take away. The wines follow a stripped-back approach, chosen by Jeremie and his team of sommeliers from Primeur and Westerns, with a small selection of natural whites, reds and sparkling wines. Interiors are simple, raw and earthy, making use of mud and lyme wash for the walls, softened by textured banquettes and Thonet chairs. Sit at one of two big sharing tables in the middle of the room, or opt for counter seating overlooking the kitchen and bakery or the front terrace. What are the best dining options near Jolene London? Jolene gyms, sporting activities, health & beauty and fitness. The best pubs near London Jolene. Jolene clubs, bars, cabaret nights, casinos and interesting nightlife. Where to have your meeting, conference, exhibition, private dining or training course near Jolene. From cheap budget places to stay to luxury 5 star suites see our deals for Jolene hotels, including Hilton London Islington Hotel from 88% off.